The display shows an assortment of package headers built in Hermetic Seals. The examples are mostly for special purpose high reliability applications. 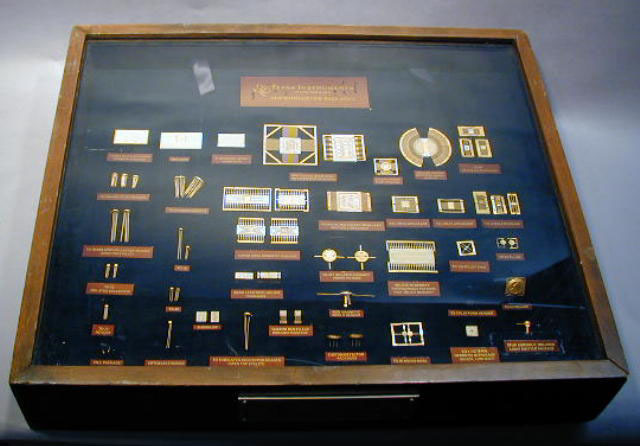 The display shows some of the variety of skills developed in providing packaging for semiconductor devices: plating, film deposition and patterning, glass to metal and ceramic to metal sealing. Some of these packages were produced in fairly high volume, but most were low volume for special applications. Related material in collection: G00277-9, 289-90.